Scientists claimed able to predict the death? Death is an inevitable phase of life. Most people accept the coming of death as a mystery. However, some scientists are not. A group of scientists researching the pace of life a living creature. And now, they claim to have successfully predicted the death with an accuracy of 80 percent. During this time, biologists assume only two basic phases of life, childhood and adulthood. Childhood indicated by the rapid growth and development. As well as low mortality rates in this phase. Meanwhile, adulthood is marked by sexual maturity. The mortality rates are also low because adolescence is the best time and usually living things produce heredity. In adolescence, the body begins to ripen. The aging initially slowly but gradually accelerated. Every year the mortality potential is increased. Laurence Mueller and Michael Rose, the two of biologists from the University of California at Irvine conducted a study on the fruit flies Drosophila to unravel the mystery of death. "We took 2,828 female flies and put each of these flies with two male flies in a bottle," said Mueller was quoted as saying on the BBC Earth on Wednesday, June 22, 2016. Every day, scientists move the female flies to a new bottle and counted the number of eggs produced. They conducted an experiment for several weeks until the flies die. Indeed, the age of flies are only a few weeks. Initially, the study results was disappointing. Scientists did not find anything worthwhile. However, when the scientists looked at the data more closely, they realized there was something different before it dies. "I noticed the difference in the fertility rates between the females will die with females who still have a lifetime of a few weeks," said Mueller. In simple terms the female flies experienced the declining fertility rates on two weeks before it died. It is seen from the number of eggs produced each day. The decline rates occurred regardless of age. For example, the flies that lived 60 days and being went to its death as well as 15 day old flies equally experienced the fertility declining before it died. The fertility declining rates also experienced by a stud. Mueller said the male flies were lose their ability to fertilize the female shortly before death. Through the study, scientists showed the phase of life that has not been known so far, ie the final phase of life called "death spiral". The death prediction in the fruit flies were finally done on the basis of the number of eggs produced by the females. Mueller and Rose could predict the death with an accuracy of 80 percent three days before the death. 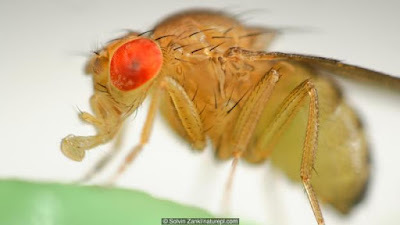 In addition to Mueller and Rose, James Curtsinger, a scientist from the University of Minnesota also examines the relationship of fertility and mortality on the fruit flies. However Curtsinger have a different opinion with the results of Mueller and Rose. Curtsinger mention that the research on the fruit flies is not an evidence of the final phase of life. He did not believe the human and the species other than the fruit flies will experience the fertility declined before death. Curtsinger also argued, "death spiral" is ambiguous and unclear. Curtsinger propose a more appropriate terminology to describe the decline of fertility on the fruit flies, ie "stop". Stages that began when the flies no longer able to produce eggs. As an illustration, the fruit flies will lay as many as 1,200 pieces throughout its life. If in a day the flies do not lay eggs, it could be an indication if something is wrong. Apart from Curtsinger opinion, Mueller maintains if the people who will die in a natural way will experience a "death spiral". Once aware of these phases, we then can figure out a way to prevent the "death spiral" phase is too long and torturous.